A good VPN is the best way to browse online securely and without restrictions. With so many options, however, choosing the right one to fit your needs can be tricky. Focusing on some of the most key features can help, and comparing them to each other can give you the best idea of which one is the right VPN for personal web browsing. Keep reading below to see how two of the top contenders – ExpressVPN and HideMyAss – stack up! A VPN can be a great tool when you’re trying to browse the web for geo-restricted content, or even if you’re just looking to further secure your online activities. With excellent security features that include private browsing, heavy encryption, and IP masking, using a VPN makes sense in many situations, and can mean the difference between being safe and someone snooping on your private data. With new alternatives popping up in the market every day and so many companies offering similar services, identifying the right fit is harder than it looks. Our tech experts have decided to jump in and try to find answers so prospective users can figure out which VPN solution is the most applicable option for their browsing needs. 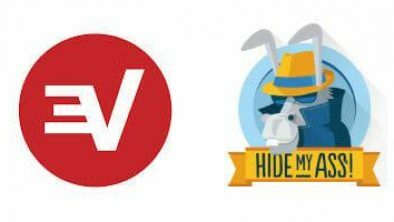 Today, we’re looking at two contenders—ExpressVPN vs HideMyAss—to see how they compare, and which features stand out. ExpressVPN is known for its outstanding customer support, and has gained a reputation for lightning-fast speeds and security. HideMyAss is hailed as an easy-to-use VPN with several server options to get around geo-restrictions. Servers: One of the key aspects of any VPN is how they perform when browsing the web. A major component for many users is how well they can browse content from around the world, without restriction. For this to work, VPNs need to offer a variety of server locations through which to route your traffic. ExpressVPN is near the top of the industry in this category, with over 1,500 servers in 145 cities across more than 94 countries. While HideMyAss does fall behind, it’s no slouch in this area, with 860 servers and 280 locations in over 190 countries available. Bandwidth: Servers are only good, however, if users can browse what they want, when they want, and for this, they need bandwidth. Some VPN services place caps on how much bandwidth users can access. While ExpressVPN offer unlimited browsing with their paid plans, HMA! offers up to 10GB bandwidth. Operating Systems & Connections: We were also happy to find that you can use HideMyAss and ExpressVPN on PCs and Macs, as well as mobile devices running iOS and Android. HideMyAss does take a slight lead here, offering five simultaneous connections in relation to ExpressVPN’s three devices. A major factor for many people selecting a VPN is how well it can access video streaming services such as Hulu and Netflix. Most of these services are geo-restricted and simply not available outside of the US, so users have to scramble to catch their favorite shows and movies. ExpressVPN has been confirmed to access Netflix, Spotify, Hulu, BBC’s iPlayer, and HBO Go. While HideMyAss is also good for unlocking certain services, recently some users have noted that they were having trouble accessing Netflix and Amazon Prime. Luckily, these issues don’t seem to be on all their available servers, but convenience-oriented users may prefer ExpressVPN instead of searching through HideMyAss’ multiple server locations. Most of our browsing these days happens on our phones and mobile devices, and in many cases on public Wi-Fi networks, which are notoriously unsafe. It makes sense that we should look to protect our phones, which contains so much sensitive personal data, from hackers by using a VPN. We were pleased to find that both HideMyAss and ExpressVPN are up to the task, offering apps available through the iTunes and Google Play Store which are easy to use and comprehensive. ExpressVPN even goes a step further, offering its services to BlackBerry users as well. Privacy-oriented users and the more tech-savvy niche prefer to customize their VPN’s access and security protocols to offer a more robust encryption, or to enhance their browsing speed. Luckily, ExpressVPN offers a full array of available connection protocols including SSTP, UDP, PPTP, L2TP, and the standard OpenVPN. HideMyAss trails close behind, offering similar protocols, except for SSTP. Overall, however, both are ideal services for users who like to customize their VPN’s access to match their preferred settings. While VPNs offer a decided advantage in browsing security, they sometimes suffer a drop in encryption, or a blackout in coverage. In these moments, users are left unprotected and vulnerable to data leaks or snooping. Many offer a ‘kill-switch’ feature, which will shutter their current connection as soon as such a leak is detected. Both ExpressVPN and HideMyAss include this in their standard features, showing their commitment to user security. No matter what you use a VPN for, one of the most challenging aspects is how some services can slow your browsing and downloading speeds. The best services take advantage of robust connections or expansive server networks to balance their loads and offer reliable connection speeds with minimal latency. Most VPN providers also include a speed test to let users find the best available connection every time they use their browser. In ExpressVPN’s case, the company does offer a test, and is known to have excellent domestic speed. Its international latency, however, has been notably high in some cases. HideMyAss also offers a speed test. Although the company’s latency has been recorded as low as 5.6%, and it only slowed downloads by an impressive 6.8%, there are several instances of users’ complaints on HMA! speed being unreliable and slow. VPNs are excellent for masking browsing activity, but sometimes you may want to leave certain websites and pages unmasked for specific reasons. The best VPNs offer the ability to ‘split-tunnel’, or hide certain activity through the VPN, while leaving the rest untouched. ExpressVPN offers this feature, giving greater flexibility in browsing when compared with side-by-side with HideMyAss. In the end, the goal with any VPN is to enhance your security and privacy while browsing. Connections in public locations, and even at home, can be monitored and hacked fairly easily. As such, a VPN should always show a strong commitment to protecting their users’ data. We were happy to find that both HideMyAss and ExpressVPN offer the strongest encryption possible—AES-256-bit encryption—as well as different settings for connection protocols. Unfortunately, neither support VPN connections over Tor browsers. Another key consideration for choosing a VPN is what user activity they log, as these records can be easily used to identify a computer, defeating a VPN’s purpose. ExpressVPN is transparent about their logging activity, as they do collect time stamps, server access, and data usage information, though they do not collect IP addresses. Most of their collection is for operational purposes. HideMyAss does keep track of assigned IPs and user IPs, though they only share it when legally compelled. For privacy-minded shoppers, this may be a concern. Customer service is crucial for VPNs, as questions and problems might arise at any moment. ExpressVPN prides itself on its strong emphasis on this area, and offers outstanding support. The company provides 24/7 support, alongside a no-questions-asked 30-day money-back guarantee with all new subscriptions. Customers can access a live chat at any time to receive instant responses from a representative. HideMyAss also offers a few channels of communication, but their chat is not a main feature, and is more meant for last-resort trouble shooting. We did find that they are quick to respond to their other means of communication, and always provide good answers. They also provide a 30-day money back guarantee for users who wish to cancel their service. Some VPNs offer free versions of their services, although these tend to be restricted and missing some key features. The best way to go is for a paid subscription, though it can be pricy in some cases. For both contenders, however, pricing is affordable and flexible. HideMyAss Pro is available in monthly installments for $11.52, six months for $49.99, or a year package for $78.99. ExpressVPN is available for $12.95 a month, six months for $59.95, or a year for $99.95. The company also offers three free months for customers who choose the full year plan, which results in a $6.67/mo. After the initial 15-month period, the subscription will return to a 12-month payment cycle. The question of HideMyAss vs ExpressVPN is a tough one. Both offer strong overall services and can benefit a wide range of users. Privacy-oriented users, as well as those who are looking for the most servers possible may prefer ExpressVPN. For simplicity, as well as a slightly more affordable alternative, prospective users may be inclined to take full advantage of HideMyAss’ VPN service. I almost feel like this is a troll article. Anyone that has used HMA knows it’s one of the inferior products out there. And then you compare it to ExpressVPN? Put it this way, HMA is the Cleveland Browns of VPN while ExpressVPN is the New England Patriots – or the Philadelphia Eagles since they just beat the Patsies. Go Eagles!! no point getting a VPN with a bandwidth limit these days. can’t believe some companies are still putting on caps. Expressvpn is the clear winner here, no contest!! You said HMA offers 10GB bandwidth but I thought that was from my internet connection. Will using the VPN change how fast my internet connection is like if I pay my company to increase the connection as well? Hello, and thanks for the question! The bandwidth that your VPN provider offers refers exclusively to the traffic that is being transmitted through their servers, be it from streaming, browsing, or downloading. Your ISP’s bandwidth may also take into account this browsing activity, but using all your VPN bandwidth will not directly affect your regular bandwidth allowance. VPNs do generally have some impact on browsing speeds because they must reroute your traffic and encrypt it, but paying to increase your ISP’s connection speed should help improve your overall velocity. We hope this helps!